Inclement weather and a botched last-minute field goal attempt spelled defeat for the Dalhousie Tigers’ football club in their Sept. 22 game against the University of New Brunswick Saint John Seawolves. The match, played amidst a roaring gale in Saint John, saw the now 1-1 Tigers succumb to turnovers brought on by poor field conditions as the Seawolves walked away with a narrow 13-12 victory. 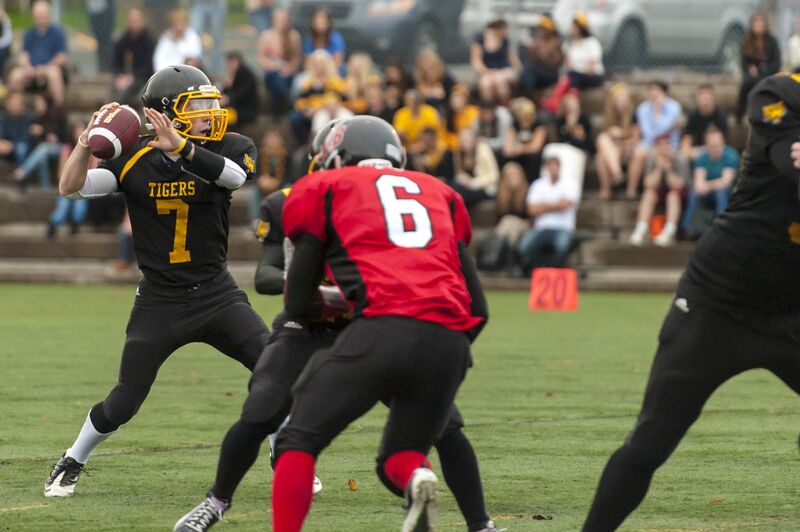 On the positive side of the ledger, the Tigers defence followed an impressive season opener with another disruptive outing, swarming the backfield and forcing several Seawolves turnovers. With heavy rain and gusting winds forcing both teams to run the ball on nearly every play, this defensive pressure proved vital in keeping victory within reach. Three quarters of defensive, gaffe-filled play left many onlookers unprepared for the game’s frenzied finale. With 2:48 left and the Tigers in front 12-10, the Seawolves nailed a 17-yard field goal to nudge ahead by a single point. Undeterred, Dalhousie marched up the field to UNB Saint John’s 20-yard line before the drive stalled, forcing the field goal team onto the field with less than 30 seconds to play. In a moment that will linger in the minds of Tigers special-teamers, three Seawolves linemen surged over the line of scrimmage the second the ball was snapped, batting down the potential game-winning field goal as it left the boot of kicker Ron Wilson. The home bench exploded onto the field in celebration, while the Tigers stared dejectedly down at their cleats. Several issues remain for the Tigers to address heading into Saturday, Sept. 28 game against Holland College, including costly-timed penalties and ill-advised passes. A little bit of sunshine probably wouldn’t hurt either. Daniel was the Gazette's Assistant Sports Editor for Volume 146.